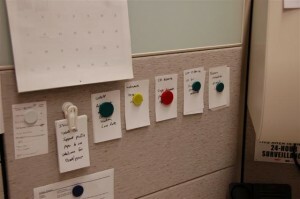 In Agile Software Development with Scrum, the authors recommend setting up a permanent scrum room, where the dev team can meet and where a scrumboard can be established. Wouldn’t that be lovely? In the real world I’m in, it’s tough enough to get a conference room for an hour, let alone permanently assigned. We hold our daily scrum in the lunchroom, and depending on which weathergirl is doing the forecast on the TV (welcome back, Julie Bologna), I can usually hold my team’s attention. Tasks we’re working on start in the sprint backlog on my hutch. 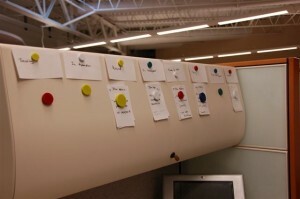 As the rented mules dev team members progress on a task, they move it from from one status to another as indicated by the top row of index cards. When a task is completed, they can grab another one from the backlog (this current sprint is winding down, so there are no tasks in the backlog). The colors of the magnets have no meaning, but the diameter gives you a quick indication of the depth of each status pile. 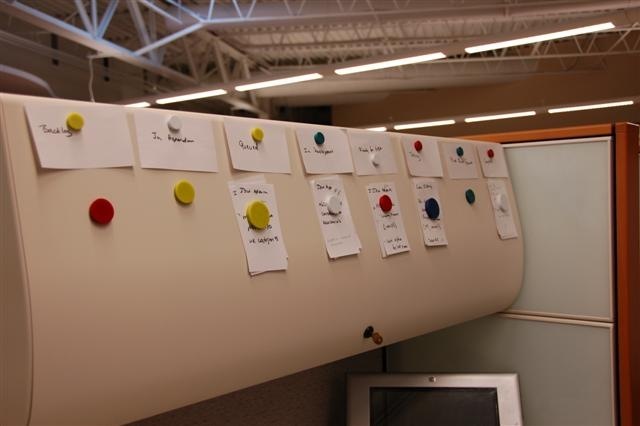 A scrumboard on my hutch is one of the reasons we’re writing Scrumr, which will replace all these magnets and index cards with a web based application. Previous Previous post: Please vote for Scrumr! Next Next post: CR.NET 2005/2008 book is here!